What are the top landmarks in Chiang Mai? Enjoy the student vibe around Chiang Mai University, a top university in Chiang Mai. Add the area's shops or temples to your travel plans. You can enjoy some retail therapy with a trip to MAYA Lifestyle Shopping Center, a favourite shopping spot in Huay Kaew. While you're in the area, find time to visit its temples. You can find the perfect gifts to bring home when you visit Warorot Market, a popular shopping spot in Chiang Mai. While you're in the area, find time to visit its temples. Old City is an historic, walkable neighbourhood with convenient options for cafes and restaurants. Part of the neighbourhood’s charm is its rich culture. For a taste of local culture, you can visit the temples and shopping. Nimman is a trendy neighbourhood that’s popular for its cafes, bars and coffee shops. Part of the neighbourhood’s charm is its festivals. Broaden your horizons with some local shopping. Chang Moi is a welcoming neighbourhood. The neighbourhood has many appealing features, among them its festivals and rich culture. You can satisfy your cultural palate with temples and historic landmarks. Chang Khlan is a welcoming, romantic neighbourhood with convenient options for restaurants. Part of the neighbourhood’s charm is its rich culture. For a taste of local culture, you can visit the shopping and temples. 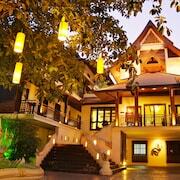 Chang Phueak is a welcoming, secluded neighbourhood. You can satisfy your cultural palate with temples and shopping. Tha Sala is a welcoming, relaxing neighbourhood with convenient options for restaurants. The neighbourhood has many appealing features, among them its natural features. Broaden your horizons with some local shopping. Everything about the hotel was awesome! The front desk staff was excellent. Katie and her team were so helpful booking day trips and giving recommendations to us. Very friendly people. Hotel is in an awesome location too. 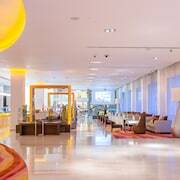 I will recommend this hotel to everyone and plan to come back again! 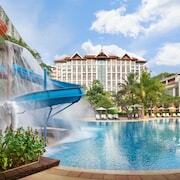 Chiang Mai is the perfect destination for families looking for fun in the sun. Chiang Mai has plenty of fun activities for children, such as Flying Squirrels, an obstacle course and zip line. Then there’s the Siam Insect Zoo & Museum - this museum not only offers a fascinating learning experience, but also lets the bug lovers in your party get up close and personal with the creepy crawlies. If you want to learn more about the history of Thailand, its religious culture and its people, then get a hotel close to the Old Chiang Mai Cultural Centre. The temples Wat Suan Dok and Wat Phra Singh are also not to be missed. 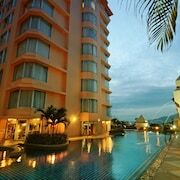 If the great outdoors is more your things, then you have plenty of special deals on Chiang Mai hotels located near beautiful destinations like Wat Phra Doi Suthep and Doi Inthananon. 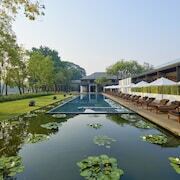 Why not book into one of Chiang Mai’s top hotel, The Imperial Mae Ping Hotel. 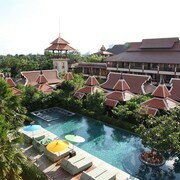 The Imperial has its own coffee shop, full spa facilities, fitness centre, and two swimming pools. 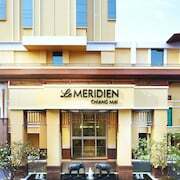 What’s more, the hotel also offers large and small meetings rooms, perfect for business travellers, and a number of international restaurants onsite. Book a stay at the Tamarind Village another top hotel with everything you could ever need for a relaxing getaway. Choose from a variety of natural beauty and spa treatments at The Village Spa, performed by specialists. 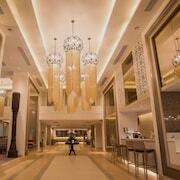 Browse the on-site boutique shop and dine on local delicacies at the hotel restaurant. Look no further than Sirilanna Hotel for a comfortable and inviting accommodation at prices which are sure to fall within your Chiang Mai travel budget. The Sirilanna welcomes you to take a lap in the swimming pool, indulge at the Thai restaurant, and take advantage of the spa and massage services. 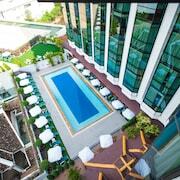 Be sure to take a look at our great hotel deals in Thailand's capital. 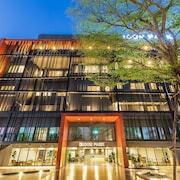 Check out our hotels in Bangkok. Explore Chiang Mai with Expedia's Travel Guides to find the best flights, cars, holiday packages and more!